Note: Please read Planning Observations carefully before submitting proposals. AO188 is a curvature wavefront sensor based adaptive optics (AO) system. The curvature wavefront sensor is made of 188 photon counting APD modules that feed to a 188 element bimorph mirror. AO188 is installed at the IR Nasmyth platform of Subaru telescope and offers natural guide star (NGS) and laser guide star (LGS) modes. The open-use instrument behind AO188 is IRCS. SCExAO, SCExAO+CHARIS, SCExAO+VAMPIRES, and IRD are also available with AO188 as PI type instruments. AO188 in the NGS mode has been offered for open use observations since S08B. The NGS mode requires a bright star within 30 arcsec from the science target. If your target itself is bright enough and not very extended, you can use it as a NGS. To obtain reasonable performance improvement, the NGS should be brighter than R magnitude of 16.5. Diffraction-limited spatial resolution can be achieved at KLM-band with a sufficiently bright guide star at good observing conditions. At shorter wavelength (zJH band), high spatial resolution comparable to or even higher than the K-band diffraction-limit resolution can be achieved. The maximum Strehl ratio so far achieved at K-band is 0.55 at a 0.5'' seeing condition. Since the latter half of S11A semester, the LGS mode has been open to public. LGS mode uses an artificial sodium laser guide star for high-order wavefront correction. Because an artificial guide star can be created close to or on top of the science target, better AO correction is expected using the LGS than a far away NGS. 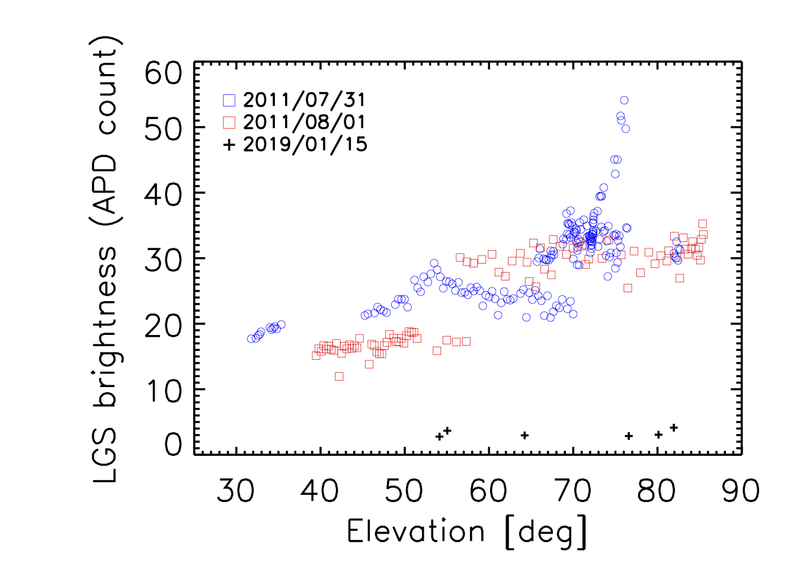 The brightness of the LGS was around 10.5 mag in R-band in 2011; however, it is now R=14 at El=80 degree with a natural seeing of 0.5 arcsec as of January 2019. This brightness might become faint depending on the sodium layer condition and telescope elevation. Please check the figures below to notice the LGS brightness difference between 2011 and today. A natural guide star is still required for the LGS mode operation to correct for the tip-tilt motion that cannot be sensed by the LGS. The tip-tilt guide star (TTGS) requirements are less restricted than NGS mode: brighter than 18 mag in R-band and located within around 90 arcsec from the science target. You might be able to get small correction with the guide star as faint as R~19 (only in dark night). The performance of the LGS mode is summarized in the performance page listed below. Laser brightness as a function of elevation. The laser brightness is presented as a detector count on the left figure and R magnitude on the right figure. AO fits header information can be found here. Previous AO36 system has been decommissioned since S08B semester and no longer available. If you need the information of AO36, please see old AO page. Please cite the following paper when you refer AO188 in your publication. 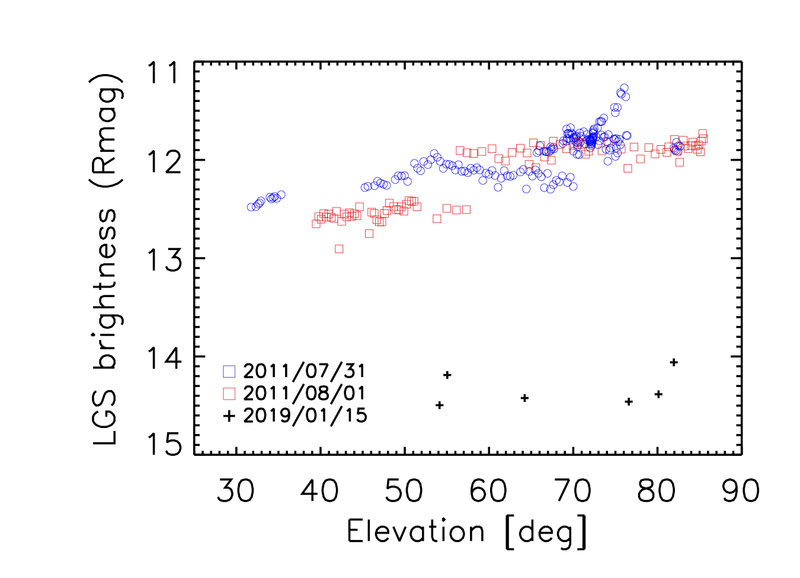 "Commisioning status of Subaru laser guide sta adaptive optics system"
"Current status of the laser guide star adaptive optics system for Subaru Telescope"
Questions regarding this page should be directed to Etsuko Mieda ( ). Please note that all numbers on these pages are subject to change as the performance of AO188 is better determined. Copyright© 2000-2012 Subaru Telescope, NAOJ. All rights reserved.